Whether topping off a crispy pizza, fresh spring greens, or more, these black olives are sure to please. 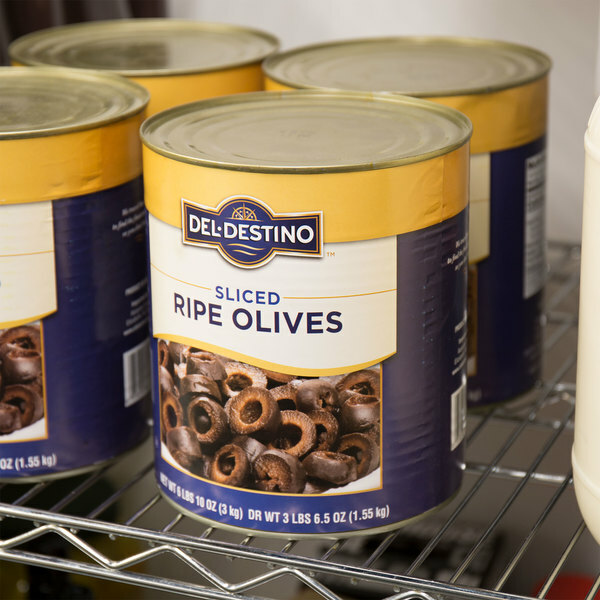 Conveniently pre-sliced and preserved in a generously-sized #10 can, these olives ensure you'll be in good supply for your patrons, and the ease of preparation will allow for fantastic service. Black olives are firm in texture, sweeter and nuttier in comparison to green olives. Serve them alone as part of a rich and flavorful olive bar or blend them up as part of tangy and sweet vinaigrettes or tapenades. Sliced black olives are popular on a variety of items, including subs, sandwiches, salads, and pasta salads. Serve atop flatbread or with penne pasta primavera. Black olives taste great when paired with sundried tomatoes, roasted red peppers, artichokes, feta cheese, and more. Whichever way you decide to incorporate these sliced black olives in your signature dishes, they're sure to be a favorite at your salad bar, Italian or Greek restaurant, or cafe. 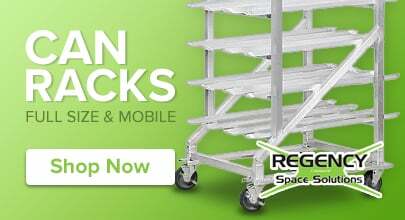 Great for our salad bar. These stay fresh for a decent amount of time. They are pretty standard, so nothing super fancy if that's what you are in search of. I used these at my wedding for our taco bar! It was such a hit with our guests, they loved the idea of making their own tacos. The price was very reasonable and the tasted great! 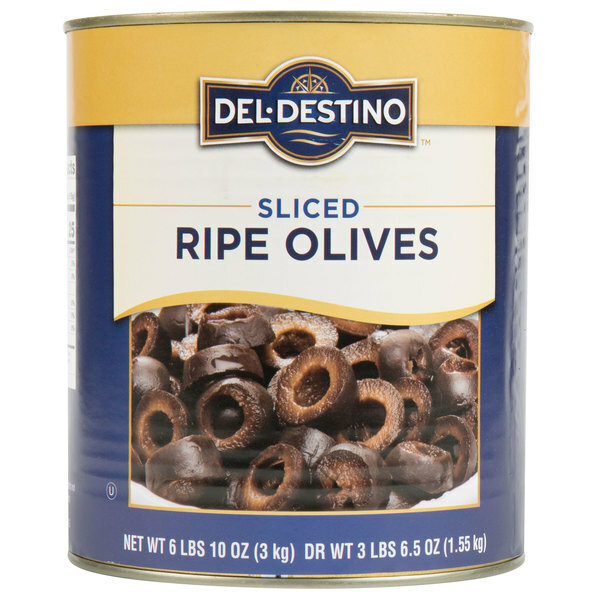 The can of sliced black olives are wonderful and a great buy as well. The olives are great for making our flatbreads and using as pizza toppings. used on our family reunion taco ans nacho bar. everyone loved the taste and they tasted fresh. will buy again no doubt thanks for a great product. The can sliced black olives are perfect quality and great for our sub sandwiches. The olives are nice and taste amazing. I love the large cans as well. They store great. I love these sliced olives and they have the best flavor. They are great for making quesadillas and omelets and are unbeatable in price and quality. These are perfect for taco, nacho, and baked potato bars. 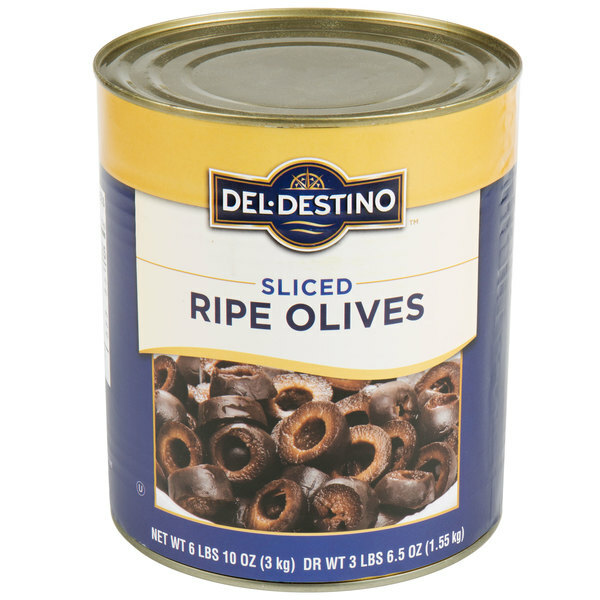 The slices are consistent in size and the can is full of olives- not liquid. I make a lot of veggie pizza as well as salads. I like that there are so many olives in here. It makes my life easier and these ones are always fresh. 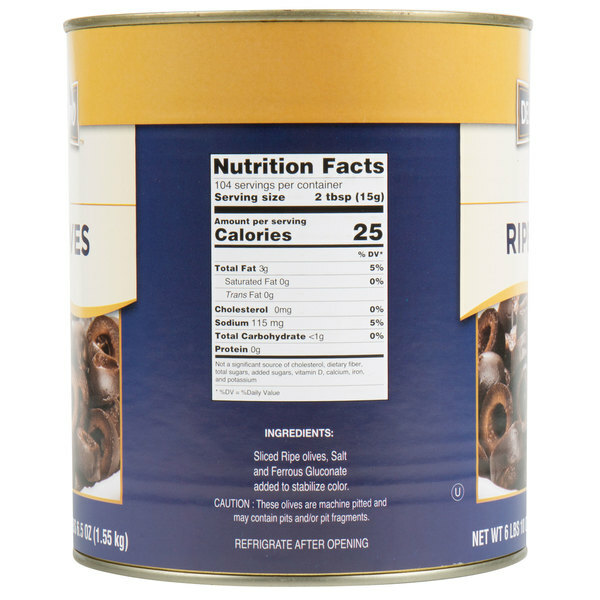 A very tasty sliced black olive that come in a great number ten can and at a great price. The olives are perfect for topping pizzas and subs. They save us a lot of time on slicing. What a Fantastic price for a great sliced black olives. 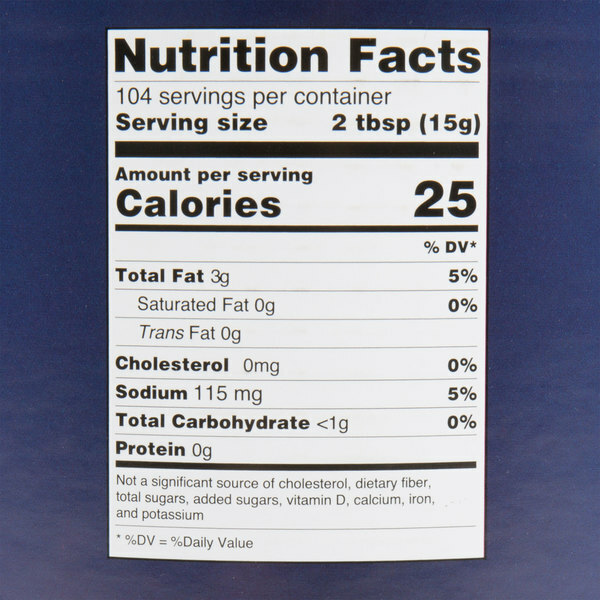 These are good on salads, toppings for pizza, as well as just to snack on! Recommend! Thanks for replacing this item, the previous item arrived in bad condition. The olives are great, and the price is even better. Thanks a million! Great black olives slices! I love nice even slices and also the fact that it is just perfectly salty! Great price for such a large can! These are for the salad bar. I am not sure how many people will like olives but I am certain thatnthis giant can will provide more than enough! Anyone have a recipe that calls for,lots of,olives?